With the likelihood of a move to Melbourne I didn't want to transport a disassembled motorbike. 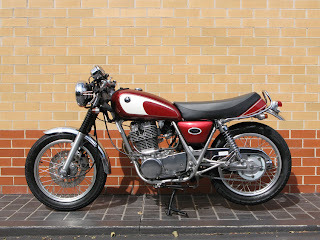 But with no hope of finishing in time, I thought it wise to reset the bike and get it running again. So its back on with the original tank, seat, gauges and headlight but also on with new decompression cable and a Daytona decompression kit from Vanem. I don't mind putting lots of the original parts back onto the bike because I'll be able to test the adjustment of the cables and routing of the wiring in a much more straight forward manner. The original headlight is great for hiding all the wiring - I'm starting to think I should keep it! Hopefully with the original, rather than final parts in place, the bike will be less delicate to transport... I'd hate for something to happen to that shinny aluminium fuel tank. Amazingly the motor turned over on the second kick - the tank had been off for 3 months! It was good to go for a ride and to test the new reduced turning circle (caused by the steering limiter which stops the clip-on bars hitting the tank). It was also interesting to experience the first stage of the new riding posture... reaching down onto the handlebars certainly does add strain on both the wrists and the neck. But these will be sacrifices worth making! When I pulled up at the first set of lights another motorbike came up along side - the rider immediately started asking questions and complimenting me on my bike - and this without the cool tank and seat! It wasn't until I pulled away that I noticed that I'd forgotten to put on the rear view mirrors. resolve the graphic treatment on the tank... and the many other things that I haven't even identified yet!